Following Monday’s bombing at the Boston Marathon, Sports on Earth spoke to Bill Braniff, the executive director of the Maryland-based National Consortium for the Study of Terrorism and Responses to Terrorism for insight into terror attacks on sports events. What makes sports events attractive terror targets? Braniff: Several things. Terrorism is propaganda via the media, and sporting events allow terrorists to leverage the presence of the media which is already on the scene. There’s already human interest in the event as well. If you want your greivences highlighted in the national media, there has to be a camera rolling – and [terrorists] know the cameras will be rolling if they can create the spectacle. Sometimes the sporting events are symbolic of the grievance, at least to the perpetrators of the grievance. There have been about seven other incidents that we know of in which marathons have been attacked, from the 1970s going forward. A host of different reasons. In many cases the government officials [present] at the start of the race were the targets. Or [terrorists were] targeting a specific individual along the course of the race. In 2008 in Sri Lanka, a government diplomat was the target at the start of the race. Attempted assassination. In Lahore, Pakistan, there were individuals rioting about men and women running in the race together. More of a social, religious motivation. The race itself was the target. Any other reasons particular to sports? Braniff: There’s something communal about a sporting event. Something that you can see [in an attack] - the moment where the social fabric gets ripped apart. You have thousands of spectators cheering, people accomplishing something positive, an apple pie moment. There’s something comforting about our passion for sports. And marathons are very communal events. Really positive and pleasing. With an attack like this, they talk about the record scratching and the moment being torn. The attack stands in stark contrast to the moments leading up to it. We’ve seen attacks on the daily commute. That is somehow less iconic [than a sports event] – although it is part of our day-to-day routine, which gives it its own psychology. Equally frightening, but in a different way. And there is also the pragmatic part — at a marathon, you’re not [necessarily] passing through a security checkpoint. It’s a much softer target. And you don’t just have the cameras rolling, but also crowds of people. And crowds of first responders and security people. Symbols of the government. 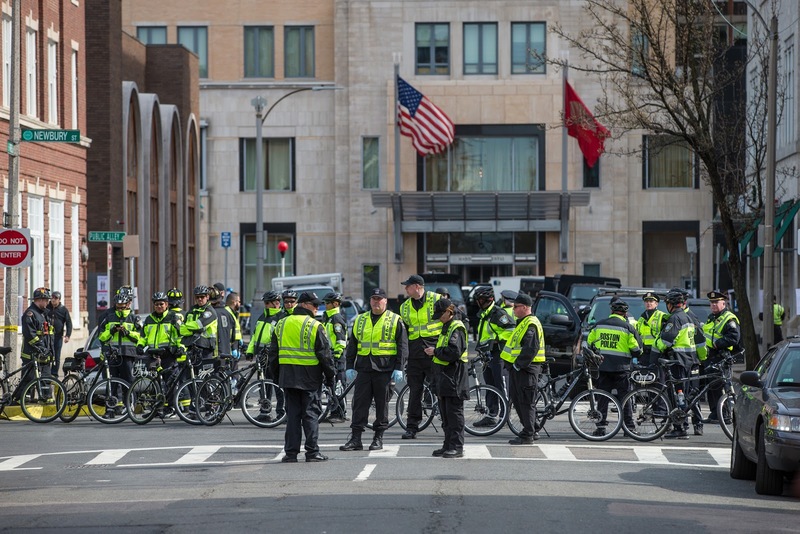 I was nervous for the fist responders [in Boston]. This is something that happens frequently abroad. You attack something like a wedding, and then when the cops and first responders come, you attack again. Given all of that, why haven’t we seen more terror attacks on sports events? What makes them unattractive terror targets? Braniff: There’s an assumption that terrorists are bloodthirsty, deranged individuals. But they tend to be discriminating in their targeting preferences, as distasteful as they may be. This is not a justification for terrorist behavior, but terrorism is often a rational behavior from someone who might have a starting set of assumptions that are abominable. They often aren’t interested in killing civilians that are unrelated to their grievance. We talk about soft targets like shopping malls, but the threshold to get someone to kill civilians indiscriminately is much higher than, say, explicitly targeting a government facility. Like a police station. Or maybe a business if you’re an animal rights or environmental group that has a beef with a certain business. Very few terrorist organizations in the scheme of things target completely indiscriminately, at least in the United States. But [Boston] seems pretty indiscriminate so far. What is being done to secure sporting events, and how has that evolved over the last decade? Braniff: A lot of work for high-profile sporting events gets done in the months leading up to these events. Not just the day of. Teams are put together from federal to local levels. Their mission is to secure, say, the Super Bowl. They work on it for a year. [On site], there are small fixes and big fixes. Developing remote and standoff capabilities, technology to try to identify explosives from a distance, so you don’t have to search bags individually. That’s always being worked on. There also has been a behavior change, with law enforcement having more people walking around the parking lot, through the crowd. If they see something out of the ordinary, they chat people up, try to identify people acting uncomfortable and acting out of the norm, as opposed to relying on static checkpoints. We all get frustrated by bag checks and [Transportation Safety Administration] checkpoints, but these things have a deterrent effect. There was a huge decrease in the number of air hijackings after the institution of metal detectors at airports. They’re not perfect systems, but you can get to a more secure environment. What are the limits that come with trying to secure sports events like the Boston Marathon, an NFL game, the Olympics? Braniff: We live in a free and open society and we love that. In the United States, we love going to the ballgame. In the absence of perfect technology that allows people to be screened without invasive measures, there is a tradeoff. Usually the the tradeoff is between inconvenience and freedom of movement. What’s the right point in that tradeoff, where the level of inconvenience and invasiveness is too high for the threat that is warranted? There’s no right answer and no obvious sweet spot. You arrive at that as a society as you try to navigate difficult scenarios. Law enforcement feels that their mission is to keep [attacks] from taking place, but if you’re going to have a free and open society, you can’t have a risk-free environment. That’s why weak groups adopt terrorist tactics. What can and should fans, spectators and participants do? What do should they be aware of? The [Department of Homeland Security's] “see something, say something” campaign is straightforward and appropriate. There have been incidents where people have identified suspicious activity and acted on it. A Times Square street vendor notified the fire department and NYPD. They secured the location and addressed it. I think there is a role for anyone, just the same as if you see a crime taking place you would report it. Same as if saw someone looking through every car window in your neighborhood, looking to do a smash and grab. At the same time, it’s important not to be preoccupied with these things. They are very infrequent as events. It’s important to put them in a broader context. I ran the Marine Corps marathon a few years ago. I remember thinking that there might be certain risks involved. [A terror attack] crossed my mind. I’m sure I wasn’t alone in thinking, this is a symbolic target. Someone had recently fired some shots at the Marine Corps Museum. But I don’t look over my shoulder going about my daily business. I don’t think that’s the right response. I’m signed up for several races this summer.